Extending the winning streak on the gridiron against Kentucky won’t be the only major event going on in Gainesville this weekend as the Gators welcome some key 2019 recruits on official visits. Big man Omar Payne will be there in addition to Scottie Lewis and Lewis’ teammate and best friend Alex Klatsky. 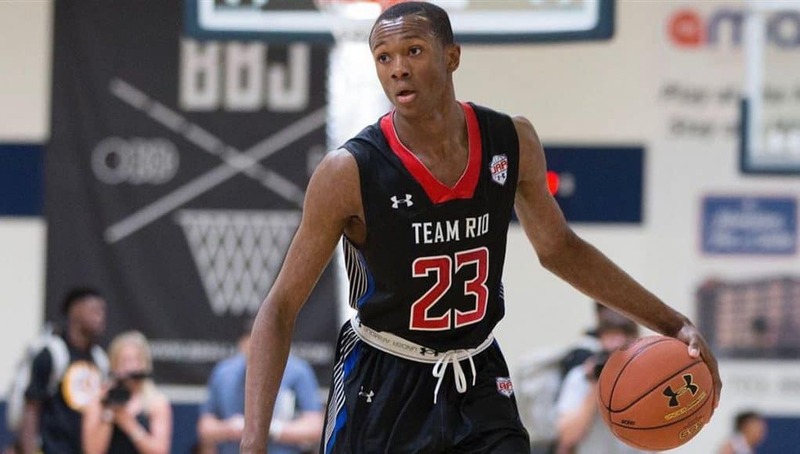 Florida has been trending positively for Omar Payne as of late and they got some good news when it was confirmed Payne would be heading to Montverde Academy for his senior year of high school. Though this doesn’t technically give the Gators an upper hand or give any indication of what Payne is thinking, having him nearby certainly can’t hurt. 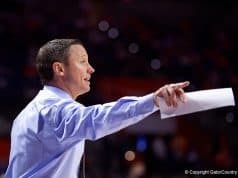 A native of Orlando, you could take his desire to stay home for his senior year of high school as an indication that he might be looking to stay nearby for college as well but your speculation is as good as mine. Being local he has already taken numerous trips to Gainesville and his official visit has the staff really excited for their final push. The Gators won’t have the final word in the decision of one of the class’ best shot blockers however as he still has visits planned to Ohio State, LSU, and Louisville (in that order). He has already used an official visit to Florida State and he plans on taking an unofficial trip to his true hometown team, UCF. Payne has been a steady riser throughout his high school career and the last update from the 247 Composite rankings has him #37 in the country and the #11 center. Viewed primarily as a defensive difference maker he moves his feet and blocks shots in a very similar way to Kevarrius Hayes, though he offers a good deal more offensive upside. Getting him would be a great compliment to the offensive styling of Tre Mann and would be a tremendous local talent to lock down. Are you a believer in the 247 Crystal Ball? They have the Gators as the favorites at 50%, followed by Florida State and Ohio State at 25% each. Scottie Lewis will also be in for a visit, and oh baby, could things be heating up here. Lewis has made multiple trips to Gainesville the past few years as he is originally from the area, though he currently resides in New Jersey attending Ranney School. For those who don’t know the story, a man named Brian Klatsky helped Lewis’ family (and Bryan Antoine’s) get to New Jersey to play for the school as well as the AAU team Klatsky founded, Team Rio. 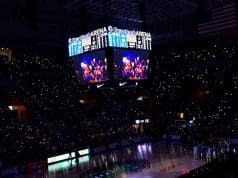 Another major connection—Brian Klatsky attended the University of Florida and after some Facebook digging that I’m not particularly proud of (the things I do for you guys!) I found his feed littered with Gators posts going back multiple years (he’s kept things a little more impartial the last year). With that Gator influence, you can see my excitement regarding his college decision. I’m not the only one seeing some smoke here as the 247 experts have started swinging the recruitment heavily in the Gators’ favor, now listing them as a 78% favorite. Included in the people expecting the Gators to land Lewis are Andrew Slater and Chris Fisher, writers from Duke and Kentucky, respectively, that are known as some of the best Crystal Ball predictors in the game. For reference, both are above 80% in their predictions and Fisher has been correct on his 9 most recent guesses. With Duke and Kentucky both listed in Lewis’ final schools the fact these writers see the Gators as favorites might say something too. The #10 ranked player in the 2019 class, Lewis is an athletic wing that can create offense out of nowhere with his explosiveness and lock down the other team’s best perimeter player. Off the court, he’s a mature, intelligent young man whose interest in social issues lead him to start a fundraiser basketball game called Hoops For The Homeless. 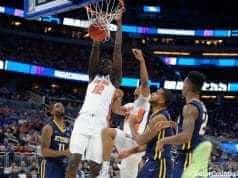 For a high school student to do something like that, you can tell a lot about his character and you know if he came to Florida he would be someone who would be a positive influence on and off the court. Visiting with Lewis will be his teammate Alex Klatsky, son of the previously mentioned Brian Klatsky. A 6’2”, 155 pound guard, Klatsky holds offers from Eastern Kentucky and Niagara. Best friends with Lewis, I think the Gators might be hosting Klatsky for a bit of a different role. As you can see from his other offers I don’t exactly think Klatsky is an SEC caliber athlete but I wonder if he might be interested in walking on. With his father being a Gator and his best friend hopefully committing to Florida (that’s my optimism showing), he might be interested in walking on. Teams are only permitted to give a certain amount of official visits (28 over 2 years) and they’re using one of them on Klatsky so they clearly see the importance of having him there alongside Lewis. 2020 top-40 player Corey Walker Jr. was slated to take a visit to the Gators this weekend but decided to push it back a week. From Jacksonville, the 6’6” wing is likely going to end up as a 5-Star by the time things are said and done and this will be a recruitment to watch. I’ve heard he wanted to push his visit back a week to get a little more one-on-one time with the staff and with the visits the team has this weekend already I think that’s a good call for both parties. Florida target CJ Walker visits Miami this weekend and verbal commit Tre Mann has taken over the recruitment of the local wing, at least on Instagram. When Walker posted a picture about him visiting Miami, Mann was quick to post “Negative. How about just Florida?” and when Walker posted a picture next to another player wearing Gators shorts a few days back Mann said “Like the shorts… where yours at CJ?” It’s good to see Mann is already helping out his new team. Will we see a major commitment soon? Stay tuned.